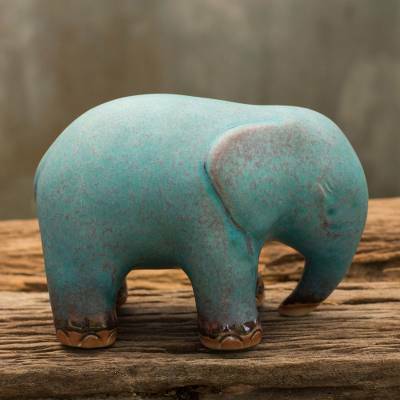 Mottled Turquoise Celadon Ceramic Figurine, "Turquoise Elephant"
Shaped of ceramic, this sleek figurine represents an elephant's grace. Duangkamol works in the painstaking celadon technique, creating a beautiful symbol of old Siam. It is glazed in a deep, rich turquoise with brown undertones. You can find celadon ceramic figurine 'Turquoise Elephant' by Duangkamol in sculpture categories such as Animal Themed Sculpture, Celadon Sculpture and Ceramic Sculpture. Enjoy exploring these sections for other Novica treasures. This sculpture is beautiful! The simplicity, texture, and shape are beautiful. This artist is definitely the one from which I will continue to acquire my treasures!